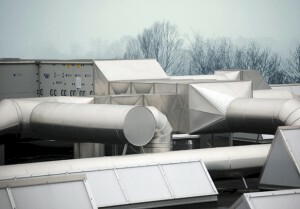 Independent tests at The Institut für Luft- und Kältetechnik (Institute of Air Handling and Refrigeration) in Dresden/Germany have shown that from an energy-efficiency perspective, a Permanent Magnet (PM) motor controlled by a frequency converter is the model favoured for use in HVAC systems. When building a HVAC system, it’s now documented that freedom to choose the most efficient individual components gives the ventilation system designer the best overall system efficiency. To get the highest performance, the individual components need to be flexible and broadly compatible, to match and combine the most efficient of each – motor, frequency converter and fan – to achieve the best system efficiency. For instance, there is no point in specifying a high efficiency motor, if it is only compatible with lower efficiency fans. The overall system efficiency will suffer, and will not reflect the high performance – and investment – in the individual components. A number of different fan-driven systems that are being promoted as energy efficient are currently available on the market. The ILK Institute has tested a number of them to determine and evaluate their energy efficiency. The study was conducted applying the installation and operating conditions found in a typical HVAC installation. The experiments carried out by the ILK Institute have shown that a fan system with a PM motor delivers the highest degree of system efficiency. EC fans and fans with an IE3 motor appear to show a system efficiency which is roughly 7% lower. At best, the performance of the system with an IE2 motor was approximately 8% below the system efficiency of the PM motor fan system. From an energy-efficiency perspective, the PM motor system controlled by a frequency converter is therefore the model favoured for use in HVAC devices.